Apple’s keyboard design is laid out in the application for a patent it received this morning. The description is in the overly-precise wording used in such things, but the intent is clear. There would be very little key travel with this design. Still, despite the keyboard being glass, the tops of the keys would move slightly when pressed. As Apple phrases it, “The glass top case may include a first glass layer defining the array of raised key regions and configured to deflect in response to a first force applied to the raised key region.” How glass keys would be able to flex as described isn’t clear. The design is similar to the Apple Smart Keyboard Folio for the iPad Pro, except that accessory uses a single police of cloth with raised keys instead of glass. This design includes all the input methods one would expect from a MacBook. As the patent application says, “The glass top case may further define a touch-input region along a side of the keyboard.” This is apparently for a touchpad. Apple considered the possibility of mounting a second screen above the keyboard. “The device further includes a second display positioned below the glass top case; and the second display is aligned with the transparent portion of the glass top case.” It’s not certain, but the intent here might be to recreate the Touch Bar. 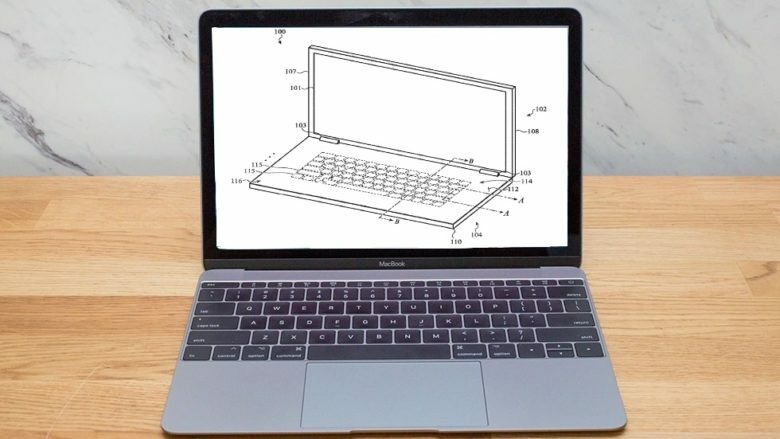 Just because Apple has a patent on this concept doesn’t mean it’ll automatically be part of the 2019 MacBook Pro. This company frequently patents designs that never get a real-world application. But at the very least it shows Apple is researching new concepts for keyboards… which seems wise considering the problems it’s had in this area in the past.